Designed by Harvard scientists, the Zeltiq CoolSculpt is a game-changing method for eliminating unwanted body fat. As we age, our metabolism slows and our bodies tend to accumulate stubborn fat. Unfortunately, a clean diet and rigorous exercise regimen is not always enough to eliminate these fatty areas. People who are carrying stubborn fat in their abdominal area, back, buttocks or arms, can use Zeltiq CoolSculpt for a targeted, non-invasive method of eliminating these fat deposits. Zeltiq works by freezing unwanted fat cells without any damage to the surrounding tissue. The freezing process destroys the fat cells, which are then naturally eliminated from the body. The procedure is relatively painless and patients are able to resume normal activity almost immediately. There is no denying the results that Zeltiq CoolSculpt is capable of achieving. For some practices, the price of the equipment can be prohibitive, especially in offices where more than one machine is desired. 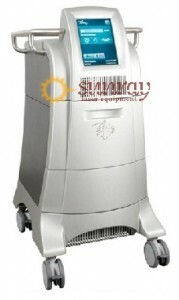 SunrayLaser.Com refurbishes and sells Zeltiq CoolSculpt machines at affordable prices. Our team of technicians reconditions our equipment to best level of quality possible. If you are interested in or have questions about the Zeltiq CoolSculpt, contact one of our expert product specialists by submitting our online price quote form below.